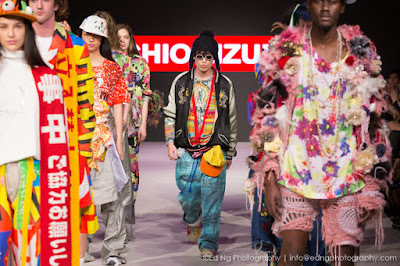 How to describe last night at Vancouver Fashion Week (VFW)? I am overwhelmed for so many reasons. Sunday night was the final note on my 20 seasons of coverage - a full decade. From now on I am a regular audience member. It was stepping into writing in the fashion world that opened the door to me interviewing people from around the world and in 2015 becoming a published author. I could not be more grateful to VFW founder Jamal Abdourahman for the opportunity and support he has given me over the last 10 years. The evening again held an amazing array of shows from ready to wear to bridal to Eco to conceptual. No two were alike and that kept us all riveted. The venue was filled to overflowing - every seat occupied and every place to stand packed. The runway during breaks was again a carnival atmosphere filled with people talking, laughing and snapping pics. With so many people in that small space, getting group shots in particular proved challenging. I have to admit, I held to my seat more. It was that crowded. Kudos to the many people who all come together to make this week happen. Today was my volunteer appreciation day where I walked through the entire venue before the doors open - front of house, backstage and hair/makeup rooms - and personally thanked all the volunteers and offer them a treat. The number varies from day to day, but over the course of the week there are approximately 350 volunteers and 300 models involved in VFW. WOW! My outfit this evening was chosen with great care. I wanted it simple, classic and locally designed. My sheer black shirt and synthetic leather/knit skirt were by RozeMerie Cuevas of JAC by JC. The red leather bracelet with Japanese silk under glass embellishment was by Shi Studio and has been in my wardrobe for over 12 years. My wonderful red shoes with unique heel are vintage John Fluevog and have also been in my closet for many years. The gold bangle was a gift this week from host Symone Says. Last but not least were my large red earrings. I wore them at my wedding 32 years ago and put them on again tonight in honour of my husband who was in the audience. I could not do what I do without his support. All week I have tried as much as possible to wear garments purchased from a wide range of independent designers, all purchased over a 12 year span. 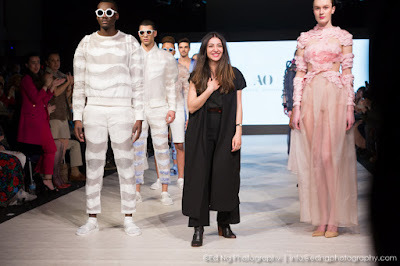 The point was to share what I learned as I stepped into the fashion world - if you take the time to make thoughtful, quality purchases from independent designers, you will slowly build a wardrobe you cherish for year to come. Make that commitment today to buy one garment or accessory from an independent designer each season. You'll never regret it. 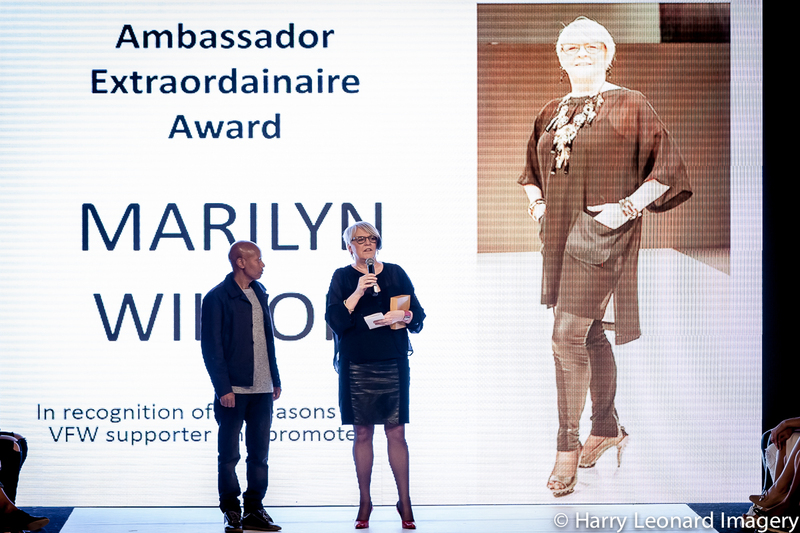 Last but not least - thanks to Jamal, Vancouver Fashion Week and all the wonderful friends and family who came out last night to share their thoughts and celebrate with me as I was honoured with the Ambassador Extraordinaire Award for my decade of coverage. I am still touched and overwhelmed. Today I chose to feature Viviane Valerius, MACHIOMIZUMACHI, Hattitude Christina Lichy and Armine Ohanyan. Designers Evan Clayton and Alex S. Yu have been added to my BUY LOCAL column and a solo article is in the works for Zuhal Kuvan-Mills of Green Embassy. My undying thanks go out to the three photographers who have labored through the night all week to get pics to me so quickly for my 14 columns - Harry James Leonard, Ed Ng and Dale Rollings. You are amazing! Viviane Valerius is a Miami based fashion designer who earned her BA in Fashion Design at Miami International University of Art & Design. Born and raised in Haiti, she has had a passion for art and design from a very young age. Her mother was a talented seamstress, Valerius spent many hours beside her watching the magic happen. An artistic person by nature, fashion design allows her to express that creativity through the beautiful garments she designs. While there was more than just wedding gowns to Valerius' show, it was the bridal offerings that received the biggest attention. I heard more than one OOOOOOHHHH and an I wish I was getting married. Looking around the audience you could see rapt expressions on many women's faces. The gowns were beautifully designed and offered in a wide range of styles. I was particularly drawn to one that was totally non-traditional - a top, peplum, pant combination with black detailing. You can see it in the centre in the top row of images. It had a lovely edge to it that I could see fitting in beautifully at a tropical destination wedding. While the wedding gowns did take centre stage, there were several lovely evening offerings. My favorite by far is the deep pink gown second from left in the bottom strip. Designer Christina Lichy offered the audience a truly wide range of hat designs from casual to Ascot worthy. Bright colour dominated as was a wonderful dash of fun - no surprise if you met the designer, especially the day she was sporting a large rubber chicken purse! Inspiration comes to her from many sources - history, colors and moods, a walk in the zoo or from old films of the 50's (but with a modern twist). Materials used include felt, straw, fur, fabric, feathers, ribbon, mica and pearl. The wide range of silhouettes offered means that there is a perfect hat waiting for each of us. The buzz for MACHIOMIZUMACHI started around me before the designer's name was even announced, so I knew I was in for a treat. From the moment the first model took to the runway, I knew I would not be disappointed. This show lived up the it's pre-show buzz and then some. The collection we saw bright primary colour, graphics, varied textures and out of the box elaborate design/embellishment. The aesthetic was strong and in your face. Some of the jackets and tops had been covered with a myriad of accessories including artificial flowers, belts and even backpacks. Most interesting is, while it would take a bold and confident person to pull it off, most of these designs were quite wearable. Needless to say, the applause as the designer took his bows was deafening. Well done! Parisian designer Armine Ohanyan closed the day with an intriguing, thoughtful show. I wanted to know more, so I checked out the website, but it was all in French of course. The designer emailed me after to let me know the name of this collection is EVOLUTION. With the help of a translation program, I gleaned a few other things as well which really helped me understand what I had seen on the runway. There were 4 sections: Winter, ice, crystallization and then spring. Fabric were varied and included a 3D white synthetic. The video behind was perfectly created to pair with the designs we saw, moving from scenes of winter to spring to water. I think designer's words say it better than I can, so I want to leave you with another quote from Ohanyan's website on the inspiration behind this collection. "We are evolving! Life changes! In our mineralized urban spaces, Nature manifests itself, transforms itself, expresses itself. The human being adapts, deforms. Universally, infinitely. The metamorphosis has no limits. The landmarks are upset. Nature represents the real, the metamorphosis, the unreal. The conceptual distinction between Man and Nature no longer exists. One transforms into the other. Deep winter buries Man. Snow and ice dominate it. Everything becomes icy. Then the human being is reborn, and the cycle begins again and again .."